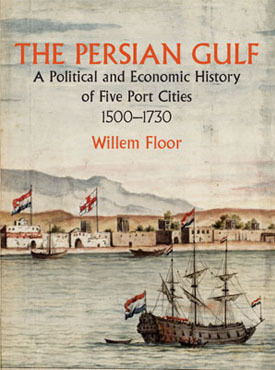 The Persian Gulf: The Economic and Political History of Five Port Cities, 1500-1730 provides the most comprehensive overview to date of the Persian Gulf at a time of major political change, including the successive arrival of the European ‘trading empires’. The study emphasizes the role of the local elites and how its members manipulated and used the administrative structures for their own gain. It also delves into various aspects of the governance of the ports. Based on a large variety of sources, including the unpublished information from Dutch and Portuguese archives, it makes clear that the Persian Gulf and the Gulf of Oman were an integrated part of the Indian Ocean network in terms of trade, culture, migration and politics. Despite that interconnectedness there were significant differences between the various competing Persian Gulf ports. These differences (as well as the similarities) in the political economy of each of the five major ports of the period (Hormuz, Bandar `Abbas, Masqat, Bandar-e Kong and Basra) are highlighted. The pattern of the local administration, the socio-economic and political structure, the morphology of each port as well as what that meant for the development and nature of trade that was carried on in each of the ports are discussed in detail. The controlling influence of the hinterland on each of these ports is stressed, while many prevailing wrong notions about the role and importance of Europeans, the nature of trade and what drove political developments in the Persian Gulf are corrected. PREFACE Since the publication of Arnold Wilson’s The Persian Gulf in 1930 a large number of books have been published about the history of the Persian Gulf, but very few about the period that this book deals with, i.e. the Safavid era or the period between 1500 and 1730—this despite the fact that it was during this period that intense regular contact between Europe and this region began. Books of a more comprehensive nature that offer a general overview of this region during this period are dated or do not add much new information to the existing knowledge. I will only mention a few of the most recent ones. The book by N.N. Tumanovich, Evropeiskie derzhaby v Persisdskom Zalive v 16-19 vv. (Moscow: Nauka, 1982), for example, only has some 20 pages on this period and has nothing of interest to offer. The book by R.J. Barendse, The Arabian Seas. The Indian Ocean World of the Seventeenth Century (Armonk/London, 2002) is a step in the right direction, because he introduces the right orientation of how the Persian Gulf area should be perceived. However, despite his comprehensive approach, his discussion of events in the Persian Gulf ports is very flawed and uneven so that his analysis is faulty and leaves much to be desired. The book by Mohammad Baqer Vothuqi, Tarikh-e Mohajerat-e Aqvam dar Khalij-e Fars (Moluk-e Hormuz) (Tehran, 1380/2001) is a great improvement on what literature existed earlier on the Persian Gulf in Persian, but his analysis is flawed by his playing up of the importance of the Persian Gulf in Safavid politics and the qualification of the Portuguese as imperialists. Moreover, he mostly relies on a limited number of primary sources for the Safavid period, although for the preceding period he has made ample use of Persian and Arabic sources, some of them unpublished still in manuscript. For the Safavid period, however, he has neither used Dutch nor the major Portuguese sources or the published EIC records and thus, per force, his discussion is not comprehensive, because he had no access to the rich archival sources of the three major European powers during that era. The same criticism applies to the recently published dissertation by Gholam Hoseyn Nezami. Naqsh-e Basrah va Banader-e Keranehha-ye Shomali-ye Khalij-e Fars dar Ravabet-e Iran va `Othmani (1049-1263H.Q./1639-1847 C.E.) (Bushire, 1383/2004). Both books are, however, a considerable improvement on what literature existed up till then, for they bring much new information to the attention of the reader of Persian. The situation is not so positive in Arabic. There is a large number of articles in Arabic, which mainly are uncritical summaries of studies done by others, while their claim to scholarship is based on putting the Portuguese and other Europeans in the role of imperialist villains. Of the very few monographs in Arabic that exist on this period and area I only want to mention two. One is the Kitab al-tanafus al-dawli fi Khalij al-`Arabi 1622-1763 (Beirut, 1981) by Mustafa `Uqayl al-Khatib. The author ascribes a major role to Arabs in the developments of the Persian Gulf (such as the expulsion of the Portuguese from Hormuz), makes many and serious mistakes in referring to Safavid Persian personages and geographical names, and his account is full of historical errors. It therefore is not a book that one would recommend. The other book is `Arab al-Khalij, 1602-1784: fi daw’ masadir Sharikat al-Hind al-Sharqiyah al-Hulandiyah (Abu Dhabi, 1995) by Ben J. Slot, which is an exception to this general assessment, because he has brought together much new information, which one may expect from an archivist of the Dutch National Archives. The draw-back of this book, however, is that its focus is on Arabs and Arabia, thus explicitly ignoring the nature of the Persian Gulf as one cultural and commercial area, but then one cannot have everything. Also, it mainly uses Dutch archival material and its subject matter is therefore limited to the 17th and 18th century. Unfortunately, this book is hard to find and although originally written in English only the Arabic version seems to be available in some libraries; at least I have not been able to get hold of the original English version. However, all these books, whatever their shortcomings, have at least tried to bring the history of this region to the attention of the readers and hopefully have generated more interest in it. Fortunately, quite a number of studies, mostly articles, have been published that deal with one or more particular aspect or historical period of the Persian Gulf during the Safavid period. First and foremost, Jean Aubin’s works about the kingdom of Hormuz in particular and about its Safavid Persian hinterland and the Indian Ocean linkages in general have been very important to make new material available and to provide new insights. Also, he has been instrumental in making scholars understand that you have to think larger than your own area, for the Persian Gulf region was a part of the Indian Ocean and the Middle-Eastern political and trading network. In particular, and not only through his involvement in the publication of the journals Mare Luso-Indicum and Moyen-Orient and Océan-Indien, but also by the methodology used in his studies he has been a leading light and guide for other scholars. In fact, Chapter One of this study on the Kingdom of Hormuz is partly a summary of his study on the subject matter (Aubin, Jean. “Le royaume d’Ormuz au début du XVIe siècle,” Mare Luso-Indicum II (1973) pp. 77-179). I only have made changes where I thought correction was needed or where I have found additional new information. Other authors who have made important contributions include (I cannot mention everybody, although everybody, I hope, has been quoted in the footnotes to this book and in its bibliography) Salih Özbaran, who has focused on Ottoman-Portuguese relations in the Persian Gulf, making use not only of Ottoman texts, but also of Portuguese documents. Jahangir Qa’em-Maqami has contributed to our knowledge by making available many original texts in Persian, Arabic or Turkish from Portuguese archives, mostly facsimiles and their printed texts from the correspondence between the Hormuz kings and his officials with the kings of Portugal. His study is more important for the documents that he has made available than his analysis of this period, which stands in need of much correction. In addition, apart from my own studies concerning this area, there are two studies that shed light on the role of the Dutch and English during the 17th century and as such provide important information and analysis pertaining to this period. These two studies are the unpublished dissertation British-Persian Relations in the 17th Century by the late R.W. Ferrier and the book Politics and Trade by Rudy Matthee. Of particular interest are two dissertations, each of which has made an important contribution to our understanding of the events of this period, although they are unfortunately known to only a few scholars because of their unpublished status. They are Trade in the Safavid Port City Bandar Abbas and the Persian Gulf Area (ca. 1600-1680). A Study of Selected Aspects (School of Oriental and African Studies, 1993/94) by Rüdiger Klein and Economia de um império. Economia política do Estado da Índia em torno do mar Arábico e golfo Pérsico. Elementos conjuncturais: 1595-1635 (Universidade Nova de Lisboa, 1995) by João Manuel de Almeida Teles e Cunha. Last, but most certainly not least, I would like to mention the unsung heroes of history to whom we all owe gratitude, in this case the editors of Dutch (e.g. Coolhaas, Dunlop, Hotz), English (e.g., Foster), Spanish (Alonso, Gil, Baião) and Portuguese archival sources (e.g., Bulhão Pato, Fellner, Rego, Sá, Schurhammer, Wicki, Baião, Cordeiro, etc.) without whose endeavors my work and that of others would have been so much more difficult, if not impossible. What I emphasize in this study is that whatever happened in the Persian Gulf was partly the result of endogenous events, partly of extraneous events. For, first and foremost the Persian Gulf was an integral part of the Indian Ocean, and we cannot study or understand what happened in the Persian Gulf without understanding or taking into account what happened in Asia and even Europe. For example, the way the European companies behaved was often determined by larger concerns about their position within Asia and Europe, which often impelled or cramped their style. Regionally, the interest shown by the large land-based empires was greatly influenced by their involvement in regional conflicts as well as by fiscal concerns. Locally, the persistence of the importance and influence of local interest groups (tribes, clans) acted as an impediment and/or instrument for central governments and had major influence on socio-economic and political life in the respective ports. Nevertheless, the emphasis in this study is on what happened in the Persian Gulf itself and in particular in the five ports that are the subject of this study. In chapter one I provide an overview of the social, religious and economic dimension of the kingdom of Hormuz, and furthermore, how the kingdom functioned and what its revenues were, and how and to what extent the Portuguese Crown benefited from its vassal kingdom. In chapter two an analysis is given as to how the relationship between the Hormuz kingdom and the Portuguese state developed between 1507-1550 and what consequences this had for both sides. In chapter three the social, economic and political situation and development of Basra is analyzed. Basra was not only the main Western outlet for Indian trade in the Persian Gulf; it also became the launching pad for the Ottoman challenge to Portuguese control over the Gulf. Basra finally became too heavy a burden for the Ottomans, who, despite several pacification campaigns, were unable to create a modus vivendi with the Marsh Arabs and therefore had to abandon the province. In chapter four I discuss the demise of the authority of the kings of Hormuz, who had become mere figureheads by the 1540s. Furthermore, the Hormuz kingdom became the transit station for Portuguese diplomats in their endeavor to hitch the subsequent shahs of Safavid Persia to their anti-Ottoman wagon. Ironically the auxiliary weapon to attack the Ottomans in the back turned against the Portuguese, when these were unable to offer realistic and concrete support to Shah `Abbas I, resulting in the fall of Hormuz in 1622. In chapter five I discuss the social dimension of life in Bandar `Abbas as well as the morphology of the town. Furthermore, I give an analysis of the importance of the two main officials in that port (the governor and shahbandar) and how they functioned locally and in relation to foreign merchants. Most importantly, the important role played by one family from Lar in controlling the littoral and its hinterland is highlighted. Chapter six does the same for Masqat, but focuses on Portuguese attempts to make the port a thriving entrepot as well as on its transformation into a major port for the Ya`ariba state. Furthermore, I examine how relations between expanding Ya`ariba Oman and its neighbors (maritime and otherwise) developed. Chapter seven offers an insight into how Bandar-e Kong developed from a fishing village into an important port and how the Portuguese failed to make it a Portuguese emporium. However, the port developed into the Estado’s most important cash-cow, providing much-needed cash to a financially strapped Goa. In the eighth and last chapter the focus is on Basra, both where its commercial and political developments are concerned and on the administrative and urban structure of the autonomous province under the Afrasiyab emirs and the Ottomans, who repossessed the province in 1669. Although the Ottomans were once again in charge they had not learnt their previous lesson and were unable to come to a working relationship with the Marsh Arabs, resulting in a very uneasy rule.